What we read, watch, and listen to impacts our minds. I try to avoid things that will disturb my soul or disagree with my spirit. I rarely watch reality shows with bickering and fighting. I’d rather digest inspiring, educational, or uplifting brain food. Just like the body, our minds are capable of filtering out toxic materials and retaining healthy materials. Beware, too much junk food will rot a soul. Knowledge is power! What type of stuff is your mind digesting? 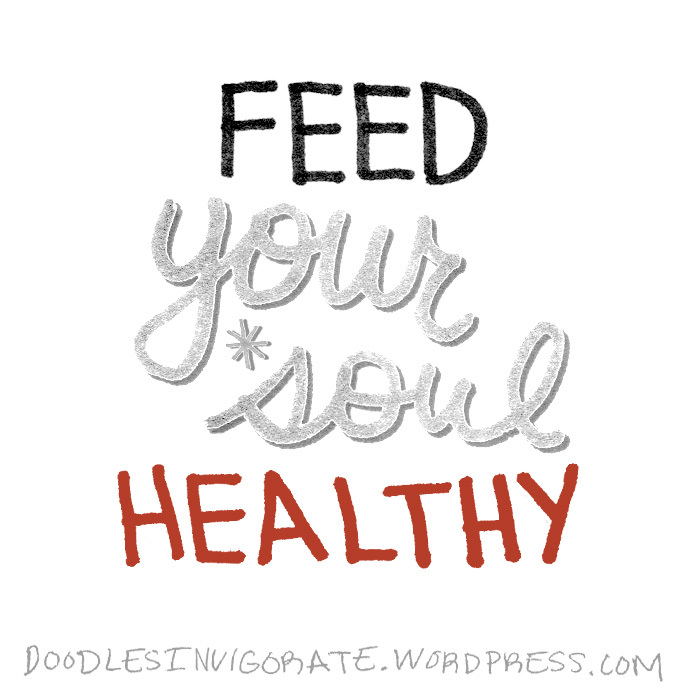 Feed your soul healthy! When God gives me a big task I fast from television altogether. It’s my way of taking a Nazarite vow. I remember a Sunday School song that went “Be careful little eyes what you see.” I used to think it was just for children, that adults can handle anything and carry on. But then I saw things that cannot be unseen and wish I had not. Now I’m much more careful where I lay my eyes. Thank you for stopping by my blog. I think I’m going to enjoy browsing through your doodles. I don’t think I’ve ever heard that song or maybe I’ve forgotten it. Maybe I can find it on YouTube. There are some things I wish I didn’t experience as well. I find with time some visuals can be forgotten or less impactful. I had thought to cut that chorus out with my cricket and stick it up behind my flatscreen tv… haven’t done it yet. Sometimes conviction is rough! Ha…there’s a post in there somewhere…”Mental Potato Chips and Ice Cream!” I’ll let you write about it. Of course I also realize you’re pokin’ fun at my snacking! See, I’m a mental giant as well as a physical one…lol. I’ll have you know I weighed this morning and I’m keeping the weight off. I’m “lean and mean,” (ha)! Enjoy your day, my dear and thanks for being you! I hope you are having a wonderful day as well! Yep…I am a great Blaze…should be my nickname or something, eh? Talk to you again soon. Now back to the gym for you, girl! Watch your “soul food” diet! Well said–and a good reminder! It would be great if a major TV news show started giving us the same percentage of good news that we now get of bad news. Just flip it. My soul needs more than the last 5 minutes to be good news. Less celebrity junk, and more ordinary heroes. I’m glad we can pick and choose on the internet. Blessings to you and thanks for promoting food for a healthy soul. Thanks! I agree. I don’t watch the news because it’s really depressing. It’s bad because I miss out on a lot of important current events. I wish we heard more stories of local heroes in stead of criminals.